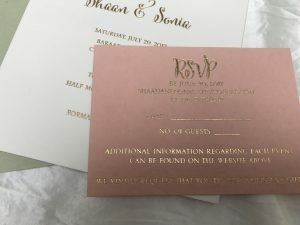 Shaan & Sonia picked a lavish invitation suite for their lavish Indian Wedding at Ritz Carlton, Half Moon Bay, California in July. The Wedding & Reception both took place at the cool but sunny, salty-aired ocean front Half Moon Bay Ritz. However, the Sangeet was in San Jose, California. The bride & groom were lovely when they came in to our San Francisco store, Hyegraph. The bride mentioned she had been online and simply was not impressed with the selection available to her. She stated that her family has a long tradition with extravagant weddings and she wanted to make her family proud. 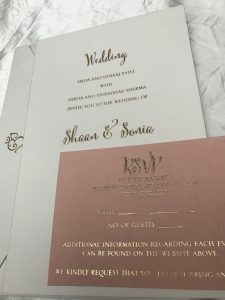 We were delighted that she would entrust us to help her design the utmost lavish, cutting edge and stylish wedding invitation fitting for the Ritz, her traditional family and of course our sophisticated bride. We were able to come up with invitations she was excited about! Sonia & Shaan’s wedding is actually three events therefore, we came up with three distinct invitations. 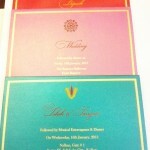 The Sangeet Invitation Card, The Wedding Invitation Card and the Wedding Reception Card. Of Course the stunning invitation suite wouldn’t be complete without elegant calligraphy by Jacques at Hyegraph. So we were happy to address our couple’s wedding envelopes and have them ready for her to mail out to family and friends both here in the California and India. Our bride was so impressed with the final product and elated to pick up her invites and mail them out! 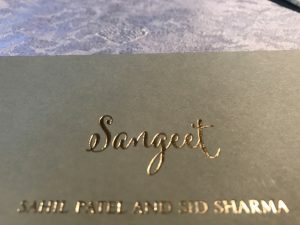 For the Sangeet, the couple chose a green 4 ply thick card with Red Gold Foil printing and painted edges. The Sangeet is the fun party before the actual Wedding. Our couple’s Sangeet invitation read, ‘…INVITE YOU FOR AN EVENING OF SONG DANCE AND GARBA FOLLOWED BY DINNER TO CELEBRATE …’. They also specified on the card for their guests to wear ‘FESTIVE INDIAN ATTIRE’. The cost for the Sangeet Invitations for a quantity of 250 cards is $1,750. The cards measure 5.5 x 8.5. 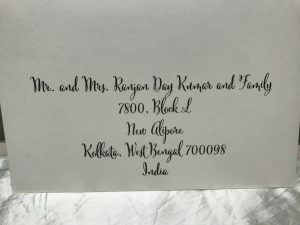 The cost of the Sangeet Invitation Envelopes, which were ivory color, for a quantity of 125 envelopes with Red Gold Foil Return Address printed on the back flap is $435. Shaan & Sonia chose a fitting cream color invitation for the Wedding Invitation. Still used the Red Gold Foil printing and painted edges. It came out very extravagant and unique. The pained edges have been a very exciting trend for our couples and party planners alike. 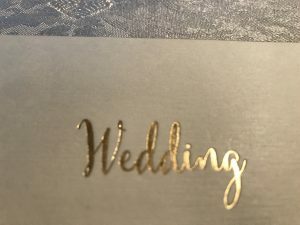 The Cost for the Wedding Invitation Card for a quantity of 250 cards is $1750. The cards are four ply, measuring 5.5″ x 8.5″. For the Wedding Reception Card, our couple chose a matching style, however, a grey card. All three cards can be seen above. 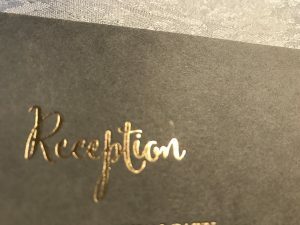 The Cost for the Reception Cards were, for a quantity of 250, without envelopes, 4.5″ x 6.25″, 2 ply. We printed the couple’s wedding invitation envelopes with Hyegraph Calligraphy (seen above). The bride and groom emailed us their guest list and picket out a font style. We did the rest! 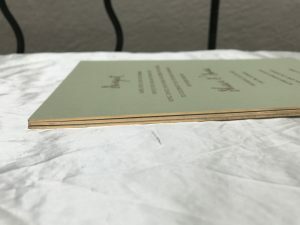 The Cost of wedding envelope addressing is $1.00 per envelope. 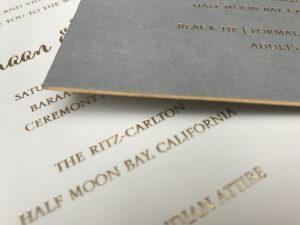 If you would like us to help you create extravagant, cutting edge and chic wedding invitations or other stationery, you can come in to Hyegraph San Francisco located at 3 Embarcadero Center in California or if you would prefer to work by phone or email, Call Us at 415-626-0461, Email us at info@hyegraph.com. We would be happy to meet with you in person or over the internet or phone. Please see our other extravagant Indian Wedding Invitations on our Blog Under Indian Wedding Invitations Category. You can see all our stationery offerings and read more about us on our website, www.hyegraph.cm. Read our reviews on YELP & GOOGLE and see why our clients trust us with their special events. We’ve been awarded Wedding Wire’s Best Couples Choice Award, and A List Best Wedding Invitations Winner in San Francisco. 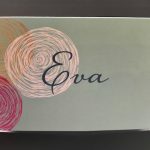 See our Calligraphy Page for fonts, styles and samples! We can also stuff, stamp and mail out your invitations. We look forward to working with you at Hyegraph San Francisco.